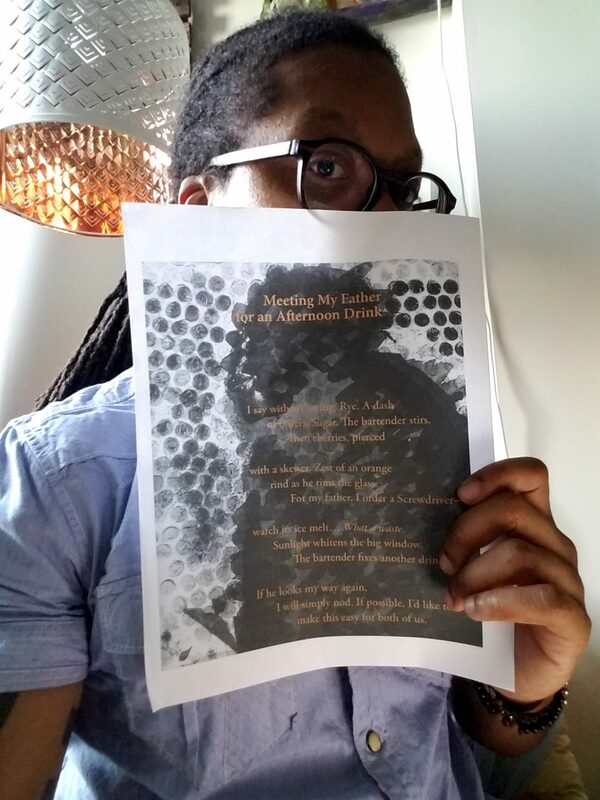 Poet Nathan McClain: Firstly, shout-out to Sam Vernon for seeing what she saw in this poem; honestly, I wasn’t sure what an artist would understand or pick up on from the poem — never thought an artist would engage with one of my poems — it’s amazing! If anything, however, I would hope (and I think Sam discovered this) an artist would focus on tone and tonal shifts within the poem. I would hope the loneliness of the speaker, as well as his sadness or disappointment, was evident, and communicated, as well. Based on what has been evoked, particularly in terms of the portrait’s color and how that affected its mood, I think Vernon understood that. Poet Nathan McClain: Not necessarily, no. I think the elements of the portrait, the hazy or blurred features of the figure against the bright backdrop, what look like fractured coins, were more highlighted or exacerbated with my knowledge of the poem. It is interesting, though, to engage a visual representation of the language presented. Poet Nathan McClain: Maybe that the figure was so close in the portrait? In proximity, that is. I don’t why, but when I picture the figures in the poem, I see them more distantly, almost similar to Hopper’s Nighthawks. You know, solitude, yet a nearness, an almost touch. My mind’s eye is a bit farther back, so it was striking to receive the intensity of this figure in the foreground. And who is this figure? Is it the speaker? The father? The bartender? Is it all of them and none of them? I found that fascinating. I enjoyed the contrast of the font color against the portraiture; that color was also surprising, pleasantly surprising. Poet Nathan McClain: I have written quite a few ekphrastic poems in fact, many of which appear in my first collection, Scale. My speakers more so inhabit the pieces rather than comment on or engage with them from without; it’s an interesting perspective to visualize. Each painting informs the speaker’s narrative in a particular way that I find intriguing, and I believe each asks for a different kind of engagement with the poem’s (and portrait’s) materials. Largely, I think I’m inspired when a piece of art seems to speak to my own personal narrative, so I’m interested in exploring it in writing. That’s typically been the case for me. Artist Sam Vernon: Literature is foundational to my practice. Poet Nathan McClain: Maybe “Radio Silence,” by James Blake? Possibly too on the nose, hahaha? I should probably choose something more classical, shouldn’t I? Artist Sam Vernon: “No One Needs to Know” by The Changes. Poet Nathan McClain: Geez, good books?? Don’t get me started. Far too many to list. I’ve recently finished Jesus Said, a chapbook by Patrick Donnelly; four-legged girl, by Diane Seuss; and Stitches, by David Small, all of which were quite wonderful. Simulacra, by Airea D. Matthews is brilliant. But I have so much reading to do. On my immediate list? Henry Kissinger Mon Amour, by Conor Bracken; Rocket Fantastic, by Gabrielle Calvorcoressi; and Richard Siken’s Crush (surprisingly, I’ve never read it). But I have so much reading to do, hahaha. My poor bookshelves. Artist Sam Vernon: Between the World and Me by Ta-Nehisi Coates. Poet Nathan McClain: To be honest, I don’t get to museums nearly as often as I should, because I tend to work so much, but while in Detroit recently, a dear friend and I spent some time at the Detroit Institute of Art and viewed their “Art of Rebellion: Black Art of the Civil Rights Movement.” There were a number of provocative pieces, though the exhibit itself was rather small, limited. The Diego Rivera murals were quite stunning. I have plenty to mull over when I’m back in Brooklyn. Artist Sam Vernon: Belkis Ayon at El Museo del Barrio. Poet Nathan McClain: What more is there to say? Hmmm. 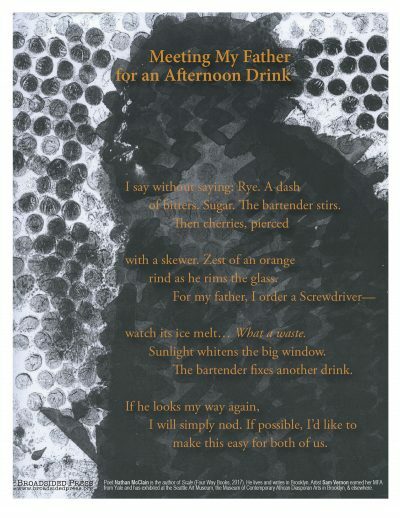 I’m grateful to Elizabeth and the Broadsided editorial team for featuring this poem/art collaboration. Visual art is often a source of creative input and inspiration for me, so to be part of this type of project is particularly humbling. I hope viewers will see, will experience, this collaborative work as such. Poet Nathan McClain is the author of Scale (Four Way Books, 2017), a recipient of scholarships from The Frost Place and the Bread Loaf Writers’ Conference, and a graduate of Warren Wilson’s MFA Program for Writers. His poems have recently appeared or are forthcoming in Callaloo, Ploughshares, Sou’wester, Hunger Mountain, Tinderbox, and Southern Humanities Review. He lives in Brooklyn.